Canadian contemporary artist Jocelyn Robert was born in Québec, 1959. His visual art, multimedia projects, sound installations and performances were shown internationally since the mid-1990s. Robert founded Avatar and Ohm Editions in 1993. He worked as sound engineer and consultant for Michael Snow’s Piano Mécanique project released as 3 Phases 3xCD on Ohm Editions, 1997. A member of groups Bruit TTV (1989-1992), Le Grand Orchestre d’Avatar (GOD’AR) and SoukSouk. 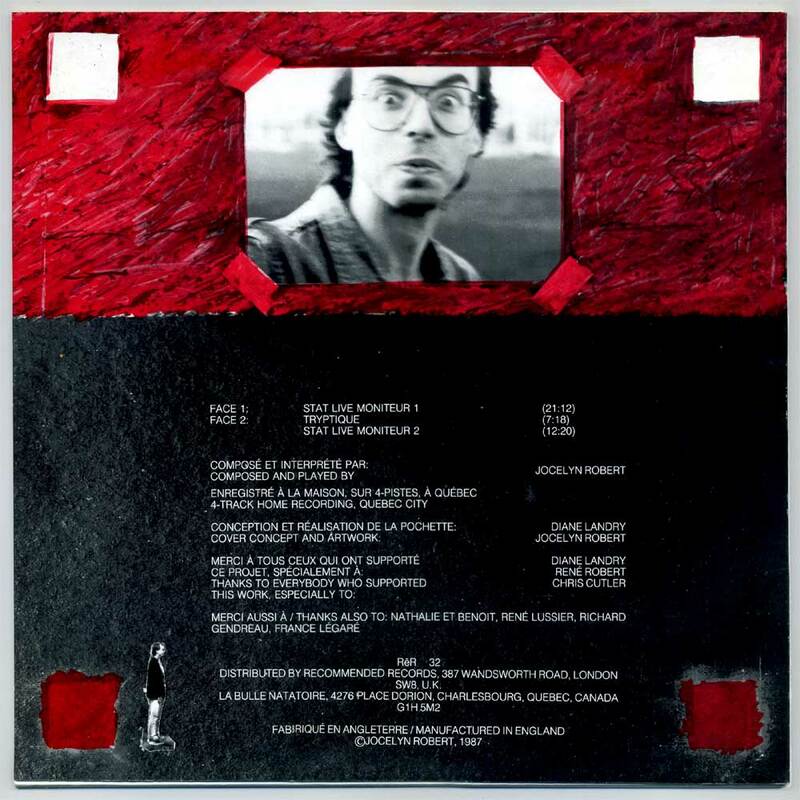 His electroacoustic music was first published by Recommended Records, UK: Stat Live Moniteur, 1988 and Folie Culture, 1991. See his offical website for more information. 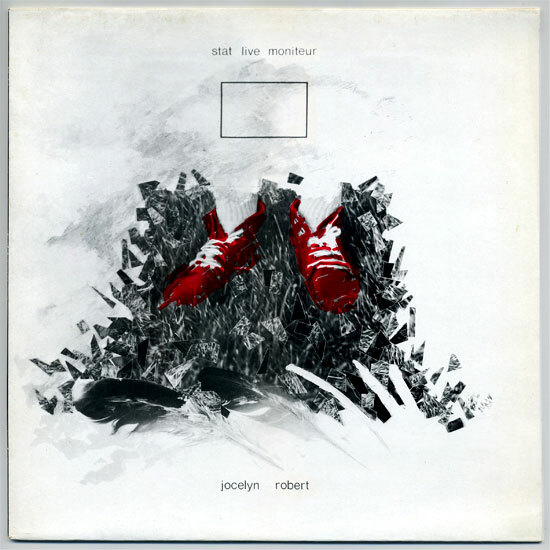 ♫ For a debut LP, this record surprises first for the maturity with which Jocelyn Robert crafts his electroacoustic soundscapes. But then one realizes the composer is already in a “post-electroacoustic” state where he seems to use the music as a mere sound stage to present his best aural finds and manipulated sounds, as in a sound diary. There’s none of the prejudices found in French electroacoustic music (think: INA-GRM), and the composer allows himself to use electric guitar or less-than-hifi sounds with a documentary quality. Stat Live Moniteur is a coherent 40mn odyssey build from multiple sources like synthesizer, spoken words, found sounds, field recordings, tape collage or turntable. The download link comes with 2 additional tracks from the Re Records Quarterly LPs. thanks continuo-you are incredible. i hadn’t heard this one in years. i do believe it is much stronger than his subsequent CD release. Hi, Steve. 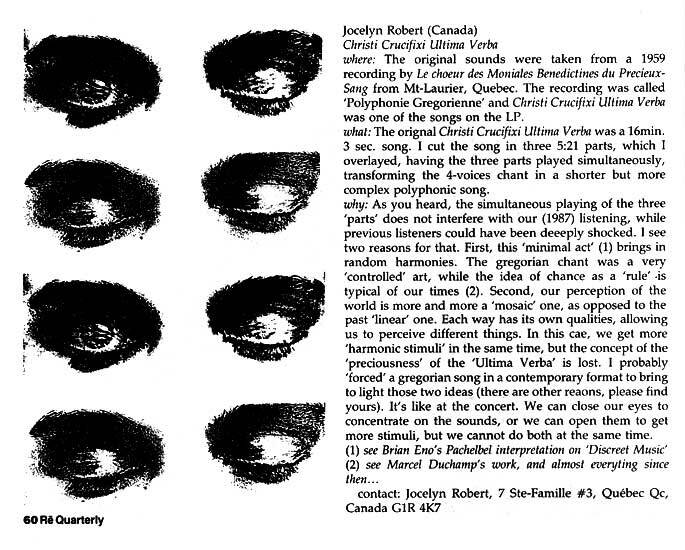 Yes, the LP is very personal and unique compared to Robert’s subsequent works. 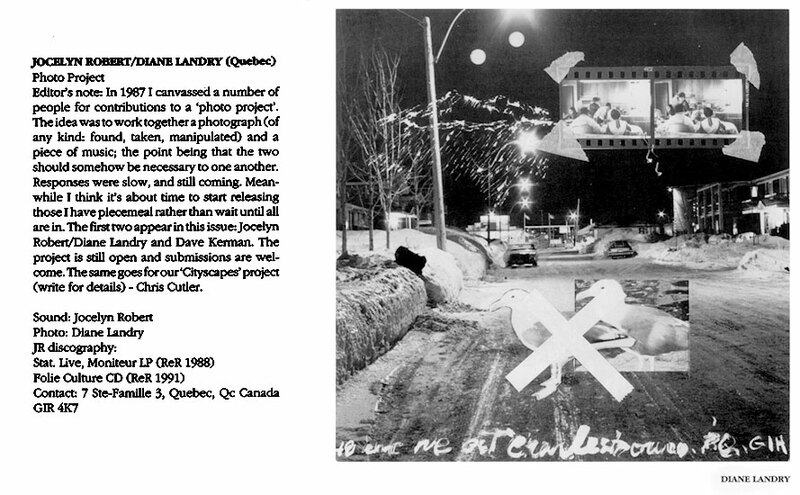 But keep in mind he moved to sound installations in the 1990s, and his sound art became more and more site specific. Thanks for your comment. Hi, this link is down, could you re upload it? I hope so. Thanks!